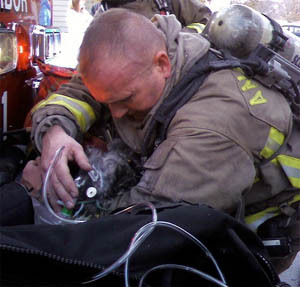 MICHIGAN -- Ann Arbor firefighters rescued a dog and cat from a burning condominium this afternoon. Firefighters were called to the 500 block of Liberty Point Drive shortly after noon. Battalion Chief Kevin Cook said the residents weren't home at the time. When they arrived, firefighters found flames coming from the floor in the dining room. They went into the basement and discovered the fire was between the basement and first floor. The dining room floor had to be torn up to finish extinguishing the fire. Firefighters searching the home found a small dog and cat that had smoke inhalation, Cook said. The pets were taken to the Ann Arbor Animal Hospital on West Liberty Street, where they were in critical but stable condition, Cook said. There was heavy smoke damage throughout the condo, and units on both sides had minor smoke damage. Cook said damage to the condo was estimated at $40,000. OREGON -- Police and Oregon Humane Society officers found four dead dairy calves and seized two severely malnourished horses this morning at a farm on South Dickey Prairie Road, southeast of Molalla. Criminal charges are expected against the animals' owner. 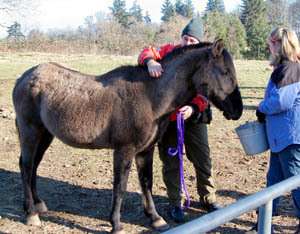 "The only water the horses had was frozen," said David Lytle, a Humane Society spokesman. "And there are other problems there, too." Lytle said investigators serving a search warrant also discovered a dead rabbit. The health of seven llamas also was being evaluated. Lytle said the Humane Society received a complaint last week about the condition of days-old male dairy calves bought at auction for $1 apiece. At that time, the Humane Society seized three malnourished calves, which died over the next few days. "That's why we wanted to get a search warrant for the whole place," Lytle said. This morning, Clackamas County Sheriff's Deputy Morgan Guthner, who specializes in livestock issues, accompanied Humane Society officers to 34534 S. Dickey Prairie Road. Together, they searched the 45-acre farm, indicating they may not be finished. Lytle said officials planned to file charges of first-degree animal neglect against 27-year-old Ora Mitchell and his grandmother, Judith Mitchell, who lives at the farm with his grandmother, Judith Anne Mitchell, 67. Ora Mitchell denied that he was mistreating animals, saying he planned to hire an attorney to sue the county. MAINE -- Three pit bulls accused of mauling a local runner remain under quarantine and investigators continue to review whether additional charges will be filed against the dogs’ owner after the Dec. 11 incident. State Police Sgt. Julie Bergan said Tuesday that the dogs will remain under quarantine for at least 10 days. Aroostook County Assistant District Attorney Patrick Gordon said he would decide whether to file additional charges against the dogs’ owner, Mary Smith, 44, of Littleton, after he had reviewed the police report. Police said the victim of the attack, 41-year-old Angela Ewings, was running on Carmichael Road when the dogs reportedly attacked her on Thursday, Dec. 11. Ewings received numerous puncture wounds to her hands, arms and legs. During the attack, Smith tried to stop them but could not control the animals. Ewings told police she repeatedly asked Smith to call 911 but Smith allegedly refused. Ewings then tried to get into a car that was in the yard but the doors were locked and Smith allegedly would not unlock the doors. Investigators said Ewings ran approximately a half-mile to the next house to get medical help. She was taken by Houlton Ambulance to Houlton Regional Hospital to be treated for her injuries. She has since been released from the hospital. Smith is scheduled to appear in court Feb. 3. Trooper Carman Lilley is the primary investigator with assistance from Littleton Animal Control Officer Randy Schools. MAINE -- A Littleton woman was charged Thursday evening with keeping dangerous dogs after three pit bulls attacked a runner in an incident near the dog owner’s home. State police Sgt. David McPherson said Friday that the victim of the attack, 41-year-old Angela Ewings, was running on Carmichael Road when the dogs reportedly attacked her. McPherson said Ewings received numerous puncture wounds to her hands, arms and legs. During the attack, the owner of the dogs, 44-year-old Mary Smith, says she tried to stop them but could not control the animals. The sergeant said Ewings ran approximately a half-mile to the next house to get medical help. She was taken by Houlton Ambulance to Houlton Regional Hospital to be treated for her injuries. McPherson said police are continuing their investigation into the incident and expect a review by the district attorney for possible additional charges. Smith is scheduled to appear in court Feb. 3. The three pit bulls have been quarantined. GEORGIA -- A woman was arrested Tuesday and charged with animal neglect after authorities said they discovered several animals on her property in "various stages of neglect." Sylvia Simmons, 59, faces 12 counts of misdemeanor animal neglect after officers with the Gwinnett County Animal Welfare and Enforcement Center executed a search warrant at her home in the 2600 block of Hewatt Road. Officers took custody of 12 cats, 16 dogs and a raccoon they say were living in unsanitary conditions. Because of the risk of rabies, the raccoon was euthanized. The dogs and cats are being housed at the Gwinnett County Animal Welfare Center, reports said. The case isn't Simmons' first arrest for questionable animal care. Police found more than 30 malnourished dogs and cats, some of them deceased, in the same Snellville home in April 2006. Several of the animals had resorted to eating their dead counterparts, animal control officers noted at the time. 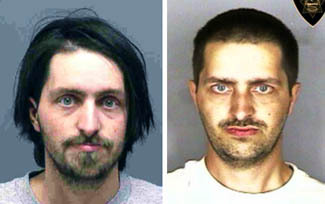 Simmons pleaded guilty in October 2007 to 28 counts of animal neglect. A Gwinnett Superior Court judge sentenced her to 12 months probation, $2,000 in fines and restitution and 120 hours of community service. Gwinnett Police Department spokesman David Schiralli said as part of her probation, Simmons was not to care for any animals for five years. He said violation of probation charges are pending. Simmons is free on $270 surety bonds on each count, records show. In her defense, friends wrote to the judge that Simmons was a compassionate caretaker who didn't know how to turn down an animal in need, according to court documents. Schiralli said the investigation is ongoing. 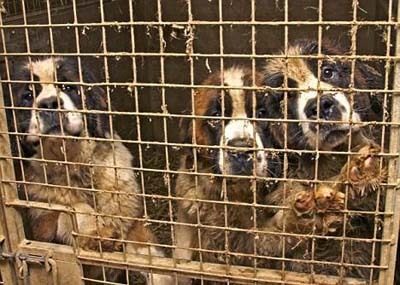 UNITED KINGDOM -- Up to 100 St Bernard dogs have been rescued after being abandoned without food and water at a kennels. Two were in such a bad condition they later died. 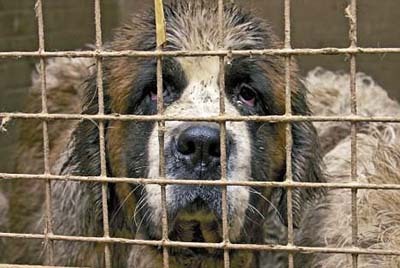 The dogs, which include puppies and fully-grown adults, had been locked in their cages and left unfed for several days. Their bowls had been upturned and many of the animals were covered in their own excrement. The kennels belonged to a well-known dog breeder, Mary-Ellen Collis. 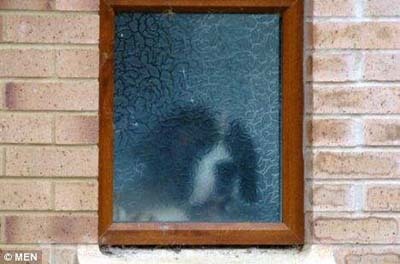 She has vanished and the police and RSPCA have been unable to trace her. RSPCA officers made the shocking discovery at the Wardana Kennels in Brigstock, Northamptonshire, on Saturday evening after a member of the public alerted police. It is not known how long the dogs had been left but it could have been for up to a week. A team of 12 RSPCA officers have spent the past three days removing the animals, but were unable to save two. The survivors have been placed temporarily at kennels in Nottingham and Peterborough where they are undergoing full health checks. Once vets are satisfied they are in reasonable condition, new owners will be sought for most of them. It is thought that four had been staying at the kennels while their owners were on holiday. The RSPCA has reunited two of the dogs with their owners and is still trying to get in touch with the remaining two. The Wardana Boarding Kennels and Cattery is well known among dog owners for its St Bernards. 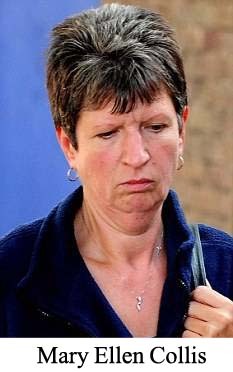 Mrs Collis, 50, was a founding member of the Kennel Club's Accredited Breeder Scheme which was set up in 2004 to encourage the breeding of healthy puppies. She is also a qualified veterinary nurse (aka vet tech) and animal groomer. The Kennel Club said last night it was 'disturbed' by the situation. A spokesman said: 'The club is deeply concerned to hear about the alleged conditions that the dogs belonging to Mrs Collis have been found in and her apparent disappearance. They, like the AKC, make appointments and tell these breeders what day they will be coming. It doesn't take a genius to realize that the breeder will make sure everything is cleaned up by that date. The discovery comes a year after 100 abandoned horses were rescued from a smallholding in Buckinghamshire. Up to 32 were found dead at Spindles Farm in Hyde Heath.